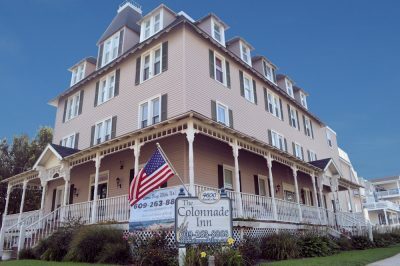 The Colonnade Inn is a hotel that was established in a Victorian style building in 1883. Our hotel is located one block from the beach and promenade in Sea Isle City, NJ. The exterior of the hotel features a large wrap around porch which is perfect for sitting, reading or just enjoying the wonderful ocean breeze. The Colonnade Inn offers daily, weekend, and weekly rental options and a wide range of units to choose from including a basic hotel room with a private bath to 3 bedroom/2 bath suites and all units include bed sheets and bath towels, air conditioning, cable, & WiFi. Our features include a newly redecorated interior with a common area for guests to enjoy coffee & tea, a small business center, an ice machine, and information on local attractions. During the summer season we provide daily maid service and beach tags are available for our guests to use.